A former rock quarry in the town of Peabody, MA had been filled in over the years with various fill materials, consisting principally of soil containing various percentages of sand, silt and clay. 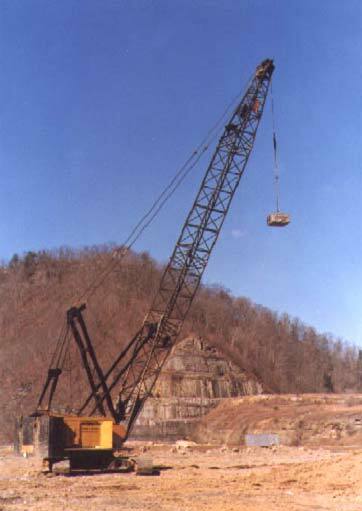 In addition, there was a layer of “ledge” or broken rock that was left over from the quarry operations. The layer of ledge was generally less than about five feet in thickness. There was a small hillside adjacent to the quarry. A total of seven buildings were to be built on the site, with the maximum height being seven stories. Dynamic compaction was selected to improve the fill soils to allow shallow foundation support for the proposed structures. Prior to TerraSystems mobilizing to the site, the grading contractor experienced extreme problems in walking equipment across the site. At one point, an excavator sank over five feet. TerraSystems’ engineers, along with Hardin-Kight & Associates, determined that the problem was caused by artesian water pressure in the ledge under the less-permeable silt and clay fill, which caused a quick condition or a “waterbed” effect at the ground surface. The problem was corrected by dewatering the ledge material. The dynamic compaction was then successfully performed. Due to the high moisture content in the fill soils, the soils still behaved in a somewhat spongy manner during compaction. During excavation for footings about two months later, the engineer said that the soils were in a very dense state and construction proceeded without incident.